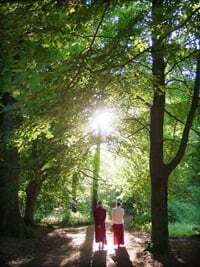 The stages of the path to enlightenment, or Lamrim in Tibetan, is the backbone of Kadampa Buddhism. Lamrim is a special set of instructions that includes all the essential teachings of Buddha Shakyamuni arranged in such a way that all his Hinayana and Mahayana teachings can be put into practice in a single meditation session. It was compiled by the great Indian Buddhist Master Atisha, who was invited to Tibet by King Jangchub Ö in AD 1042, and who spent the rest of his life there spreading pure Dharma. There is a completely pure and unbroken lineage of these Lamrim instructions from Buddha Shakyamuni up to our present day Spiritual Guides. Many great Kadampa Teachers have said that it is far more important to gain experience of Lamrim than it is to attain clairvoyance, miracle powers, or high social status. This is true because in previous lives we have often possessed clairvoyance and potent miracle powers, and many times in the past we have been in the highest positions in the human and god realms, but despite this we continue to experience uncontrolled rebirth and physical and mental suffering caused by anger, attachment, jealousy, and confusion. If we gain deep experience of Lamrim there will be no basis for these problems; we shall be completely free of all of them. First we must understand the value of Lamrim. Then by joyfully and patiently doing the meditations we shall gradually experience the fruits of Lamrim practice. Eventually we shall attain freedom from all suffering and the unchanging peace and happiness of enlightenment. These meditations, along with instructions on how to practice them and essential background material, can be found in The New Meditation Handbook. An extensive presentation of Lamrim can be found in Geshe Kelsang’s book Joyful Path of Good Fortune.